Used in many cider apple orchards across the UK this traditional English variety has a high quality juice that produces a bittersweet cider. These dark scarlet apples can also be used to make a fine juice. 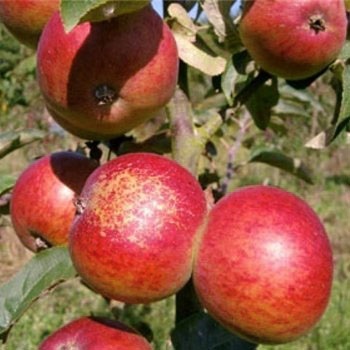 Apple Dabinett has such a delicious flavour that many of the leading cider producers, such as Thatchers, make ciders using just this apple alone. A truly vintage cider apple tree, that's self fertile, so if you're planning a very-mini cider orchard you don't require more than one tree! Dabinett doesn't require a pollinator, so only one tree is required. If you do wish to plant multiple apple trees, you will need to take their rootstock into allowance. An apple tree on a MM106 (semi-vigorous) rootstock will require approx. 4.5 metres between trees, whereas one on a M27 (very dwarf) rootstock will require approx. 1.5 metres between trees.